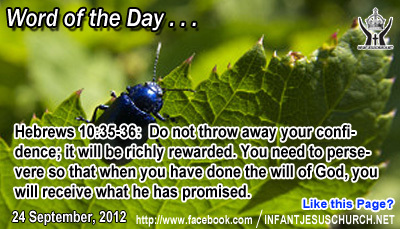 Hebrews 10:35-36: Do not throw away your confidence; it will be richly rewarded. You need to persevere so that when you have done the will of God, you will receive what he has promised. Heavenly Father, today is a good day. However, we are deeply aware that some of them those we love are close to throwing away their confidence in your love, mercy, grace, peace, and deliverance. Please use us to encourage them. Especially, we ask that your Holy Spirit to renew their hearts. We pray that you intervene directly to change the course of events and give them relief and make your gracious presence known to them. In Infant Jesus' name we pray. Amen. Jesus remarks that nothing can stay hidden or secret. We can try to cover things from others, from ourselves, and from God. How tempting to shut our eyes from the consequences of our wicked ways and bad habits, even when we know what those cost are. And how attractive to hide them from others and even from God. But, however, everything is known to God who sees all. There is great liberty and joy for those who live in God's light and who seek his truth. Those who listen to God and heed his voice will obtain more from him – abundance of wisdom, guidance, peace, and blessing. Do we know the joy and freedom of living in God's light?